Alan Greenspan US government public domain, John Travolta still from Battlefield Earth, glowing green lettering by Geoff Lee. 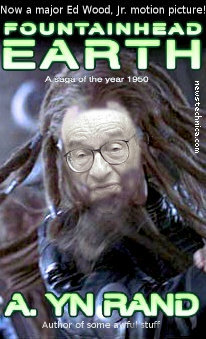 Greenspan variant on image I created for the Uncyclopedia article Fountainhead Earth. The poster asserts that the use of the movie still is fair use under US law for purposes of political and satirical commentary.